Finally: Our first Perfect Camping Night of 2009! 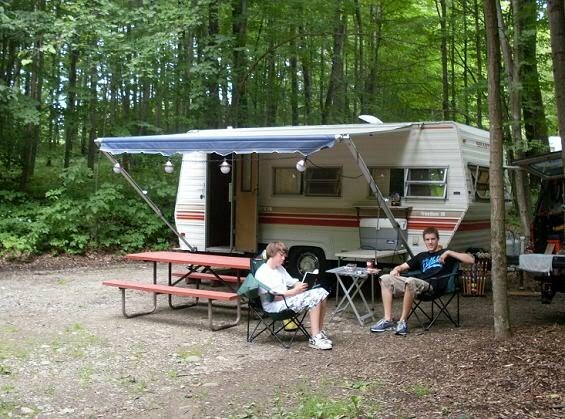 Suddenly, with very little warning, the camping season has arrived in Upstate NY. Tonight marks our very first (only slightly late) Perfect Camping Night. It's dead-calm and 69 degrees outside, after a week that started with heavy rains and temp's in the thirties. This morning it was barely 40 degrees. Then the sun came out and Summer displaced a dreary drizzly spring just like that. 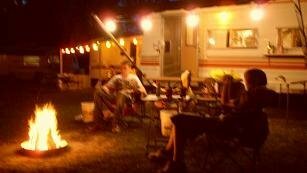 I'm ready to go hook up our camper in the dark and head for the nearest KOA right now. Last year was stunning, and the season started even earlier with five 80-degree days beginning on the 18th of April. By the end of October we'd had more than eighty "PCN's." Ironically, very few of them occurred when we were actually camping. Yeah, go figure. For those who don't mark and count every PCN as I do, here's a refresher. Perfect Camping Nights almost always follow on the heels of a (wait for it) Perfect Camping Day. Temperature matters: anything under 60 degrees overnight is a no-go. The night must be perfectly still, with nary a whisper of a breeze. Audio effects supplied by crickets, pond-dwellers and cicadas are required. Of course, no rain is allowed, despite the fact that rain and camping seem more closely entwined than peanut butter and jelly. I suppose that sounds a little obvious, after all. But those nights, those perfect under-the-stars nights, are rare enough -- even when we can count 80 of them -- that each must be treasured. Our weather here is so desperately fickle, so fiendishly temperamental, that the magical "I hate to head for bed at all" nights have to be savored. What do you need to properly honor a perfect camping night? First, you need a reasonably quiet campsite, so you can hear the night sounds. A snug camper or tent, with little more than a night-light left on is a must. A couple of exhausted sleeping kids helps the ambiance. Your sweetheart should be there to share the evening with you; one or two good friends who can tell a decent joke helps, too. What else? An orange-coals glowing fire, punctuated by the occasional snap and crackle of expiring logs, is critical. Depending on your taste, an icy-cold beer or a steaming mug of camp coffee should be at hand. You could have a little music, turned way down, just for background. Maybe a box of Nilla Vanilla wafers -- just my personal preference. No clocks allowed, since the sun will be your only alarm clock for morning. So tonight is our first candidate. I'm doing my best to savor the moment, though we haven't even registered the camper for this year yet. Yup, the first one caught me off-guard. That's okay, though. I figure there'll be more, right? And with that, Just Camping Out is at last awakened from its winter doldrums. Please stay tuned for more substantive content. We'll have plenty of guest authors, product reviews, pictures, camping tips, and short stories during the coming months. We might even let Grace Alexander return with her I Hate Camping columns. I miss those! For tonight, just a small celebration of a gorgeous evening. 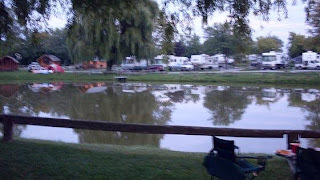 Tomorrow is soon enough to tackle the chores lined up to prepare our camper for the summer season. I can't wait to get started! How about you? What makes a perfect camping night for you? Do any from the past stand out in your memory? Share them here. It's good to be back!